2017 News | Aurelius Minerals Inc.
Vancouver, BC - Aurelius Minerals Inc. (TSX.V: AUL) (the “Company” or “Aurelius”) is pleased to announce initial assay results from the first hole of the recently completed Phase One 2017 exploration program on the Lipton Property (“Property”). The Property is located directly adjacent to the Detour Gold property and 5.5 km south of their 58N discovery. 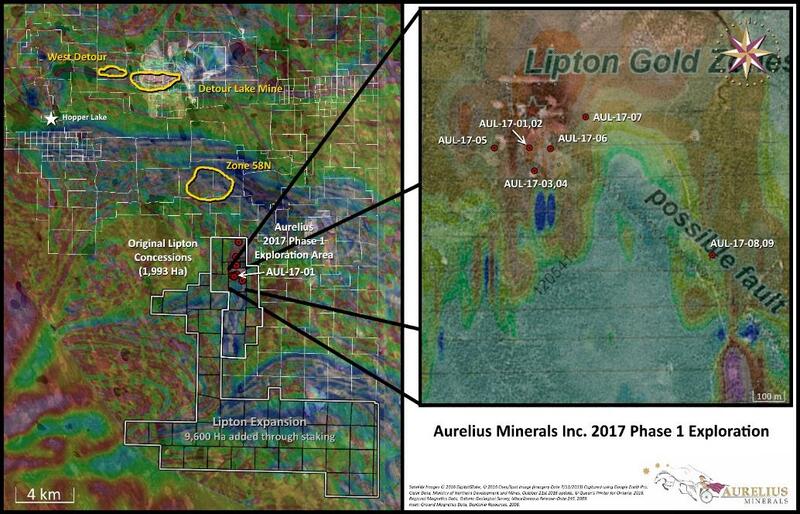 “We are thrilled with these initial results from our first exploration program at Lipton” stated Aurelius President and CEO, Mark Ashcroft. “We have secured a great property adjacent to the Lower Detour Deformation Zone and have intersected significant gold mineralization, in our first hole, within 5.5 kilometres of the Detour 58N discovery”. The 58N mineralization is a recent discovery by Detour Gold in the Lower Detour Deformation Zone. The 58N mineralization area includes results such as 11.82 g/t gold over 32.40 m (source: press release by Detour Gold dated June 2, 2014) and has opened up exploration potential south of the Sunday Lake Deformation Zone which hosts the Detour Mine. The Detour Mine has a current open-pit reserve of 16.5 million ounces of gold (source: Detour Gold website). Aurelius completed 1,833 m of NQ core drilling in 12 holes from 9 distinct platforms. The primary goals of the initial program were to confirm the local controls on gold mineralization and to test a number of new targets based on previous drilling and geophysics. Table 1: Initial Assay Results from AUL-17-01. Results may not represent the true width of the mineralization. Hole AUL-17-01 was 149 metres in length and drilled at an azimuth of 130 degrees and a dip of -50 degrees. Only partial results from hole AUL-17-01 have been received; additional results are pending. The gold mineralization intersected in hole AUL-17-01 corresponds with an area of historical drilling that could not previously be verified. The Company is pleased that these results confirm the location of the historical drilling and presence of gold mineralization as historically reported. In addition to the drilling, the Company also completed a 10.9 line km Induced Polarization (“IP”) geophysical survey, with a depth of investigation of approximately 300 m. The data is currently being processed and interpreted to identify potential drill targets. Mr. Scott Zelligan, P.Geo., the Company’s Qualified Person as defined by National Instrument 43-101 for the Abitibi Greenstone belt properties, has reviewed and approved the technical information in this release. Aurelius is a premier gold exploration company, holding the Mikwam and Lipton Properties within the prolific northern Abitibi Gold belt in Ontario, Canada. The Company has a sound management team with experience in all facets of the mineral exploration and mining industry who will be considering additional acquisitions of advanced staged opportunities in the Abitibi and other proven mining districts. www.aureliusminerals.com Renmark Financial Communications Inc.
All statements in this press release, other than statements of historical fact, are “forward-looking information” with respect to Aurelius within the meaning of applicable securities laws, including statements with respect to the Company’s planned drilling and exploration activities. The Company provides forward-looking statements for the purpose of conveying information about current expectations and plans relating to the future and readers are cautioned that such statements may not be appropriate for other purposes. By its nature, this information is subject to inherent risks and uncertainties that may be general or specific and which give rise to the possibility that expectations, forecasts, predictions, projections or conclusions will not prove to be accurate, that assumptions may not be correct and that objectives, strategic goals and priorities will not be achieved. These risks and uncertainties include but are not limited to those identified and reported in Aurelius’ public filings under Aurelius Minerals Inc.’s SEDAR profile at www.sedar.com. Although Aurelius has attempted to identify important factors that could cause actual actions, events or results to differ materially from those described in forward-looking information, there may be other factors that cause actions, events or results not to be as anticipated, estimated or intended. There can be no assurance that such information will prove to be accurate as actual results and future events could differ materially from those anticipated in such statements. Aurelius disclaims any intention or obligation to update or revise any forward-looking information, whether as a result of new information, future events or otherwise unless required by law.